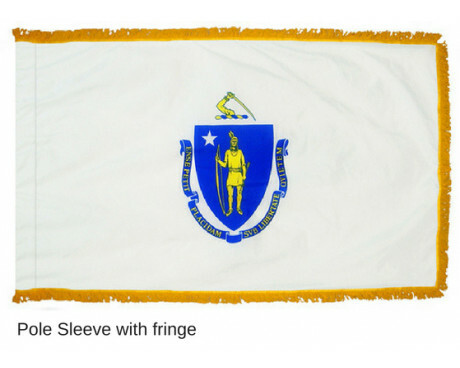 Massachusetts has represented itself with unique flags for far longer than many other states in America, but the Massachusetts flag was not authorized for official use until relatively recently. Massachusetts also stands out as one of only two states to have its own naval ensign in addition to the Massachusetts state flag. The state flag of Massachusetts has a solid white field with the Massachusetts coat of arms in the center. The coat of arms features an Algonquin man armed with a bow with an arrow pointed towards the ground. The man reflects the history of the native people of Massachusetts, and the arrow is pointed towards the ground as a symbol of peace. The symbol of peace stands in contrast to the arm which is placed above the coat of arms, which grasps a sword to remind the people that war can be necessary to win peace. The duality of the two features is embodied by the state's Latin motto, which is displayed on a ribbon below the coat of arms. The motto is "Ense Petit Placidam, Sub Libertate Quietem," which can be translated as "We seek peace by the sword, but peace only under liberty." 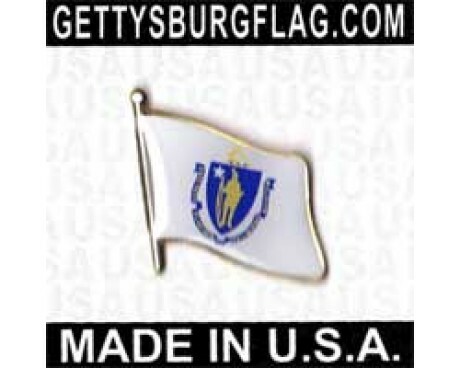 The first state flag of Massachusetts was a naval ensign that was adopted in 1776. It had a white field and displayed a green pine tree, which was a symbol of New England. A similar Massachusetts state flag came into unofficial use among patriots at approximately the same time, but it would be many years before it would be adopted for official use by the state government. A precursor to the modern design was also carried by volunteer soldiers from Massachusetts during the Civil War. 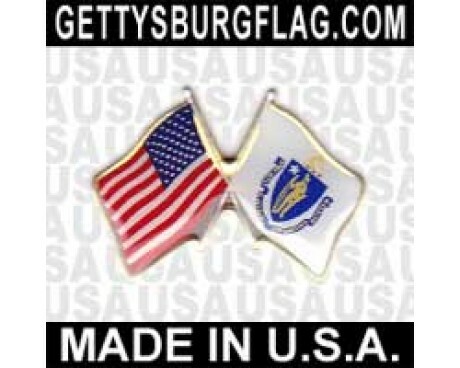 An official Massachusetts flag was adopted in 1901. The design was derived from that of the original naval ensign and did not feature the state's coat of arms. It was used until 1971, when it was replaced with the modern design. A variation on the design was adopted for use as the governor's flag at the same time, but the pine tree remains in use on the modern naval ensign of Massachusetts. 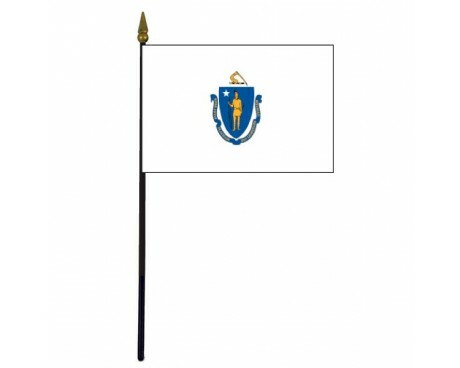 The arms and flag of Massachusetts are among the earliest. The state was involved in the Revolutionary War. In 1776 its white flag containing a pine tree, and the motto "Appeal to Heaven", was widely seen. 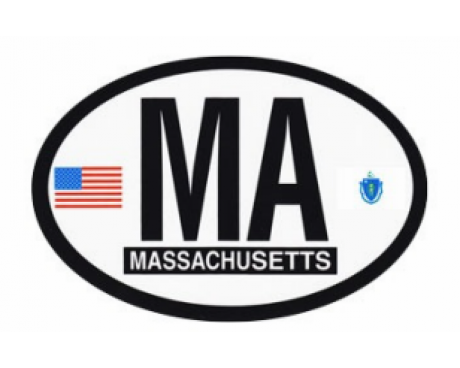 Massachusetts had a state seal as early as 1629, which was redesigned in 1780. To represent the United States an Indian from the old seal reappeared on a blue shield together with a white star. A scroll containing the state motto surrounded a shield that was surmounted by a crest showing an arm holding a sword. In 1787 the coat of arms appeared on the state's militia flag, and was joined in 1908 by another blue shield on the reverse side, however this time it contained a green pine tree. The present-day official state flag was made identical from the reverse side in October 1971. On November 1, 1971 Massachusetts decided to revive its maritime flag. It's similar to the pine tree flag of 1776, but without the "Appeal to Heaven" motto. The Pilgrim Fathers first settled Massachusetts in 1620, and the Colony was formed in 1628. It also played a leading part in the Revolutionary War, and on February 6, 1788 ratified the Constitution.